Red Fox had its humble beginnings sharing a small space in a kitchen of a small restaurant in Lincoln City. Until the demand for the bread grew so much it was impossible to keep up with the demand in that small space. A space became available in McMinnville back in 2010 so it was decided to move the location so that we can keep up on demand. Even today some Lincoln City residences still make the pilgrimage from the coast to purchase our bread. With having over 30 years of restaurant experience we pull on that experience to make every aspect of the business strive. At Red Fox we keep the same mantra, make everything from scratch and “the bread is boss”! Which simply means the bread process cannot be rushed or compromised. Red Fox provides breakfast, featuring their delicious bread. They offer the “bakery after-hours” for groups that would like to hold meetings with their featured sandwiches and local wines selection. We try not to sell anything that is sub-par and we don’t like to say no to our customers. We try whenever possible to meet their requests. At our place we bring the food out to you and provide the customer with water and a cookie with every sandwich. 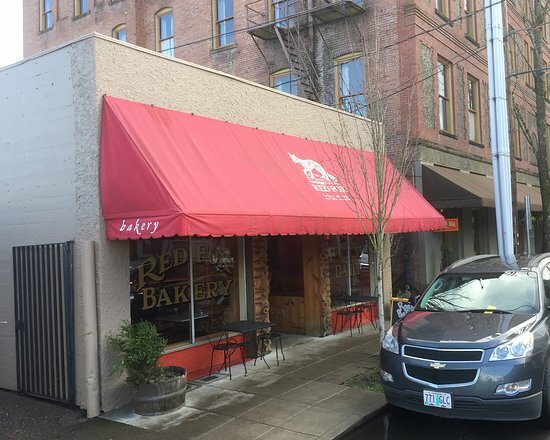 What makes Red Fox Bakery stand out is that they are the only artisan bakery in town. Their breads are authenticated recipes from Europe. Baked on a stone deck oven with steam and all of the pastry dough is made from scratch and hand rolled daily. They don’t have a commissary to support us and they don’t pull the pastry from a freezer to thaw and serve. They roll it out, bake it and serve it. At our place you can walk in the morning and buy a baguette that is still warm from the oven. Nobody offers this fresh service like we do here in the McMinnville area. Red Fox proudly donates bread weekly to the local soup kitchen. They also never turn down someone who asks for a donation. The Chamber is instrumental in the area, with lunch mobs, business promotions and being a liaison to the local government officials when we small business owners can’t be there to speak for ourselves and that is a great help to all of us. Our community although growing is still “small town” and you get a sense for that when one of us “business owners” has a need we put our competition aside and help, because we know we are in this together. Just recently our neighbor reached out to us and offered us a spot in their booth during alien days at no cost! I feel you couldn’t get that anywhere else but here. What gets us up in the morning, besides the smell of our pastries coming out of the oven of course, is the satisfaction of making people happy through food. When we hear that we just grin and silently fist bump each other because we know we are on track.